Sit down to our Slow-Cooker Spaghetti Bolognese tonight. 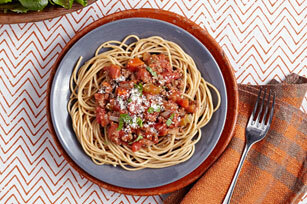 The flavor of Slow-Cooker Spaghetti Bolognese, simmering all day on low heat, really impresses. Combine all ingredients except spaghetti, basil and cheese in slow cooker; cover with lid. Cook on LOW 6 to 8 hours (or on HIGH 4 hours). Cook spaghetti as directed on package, omitting salt; drain. Serve topped with meat sauce, basil and cheese. Serve with a mixed green salad tossed with your favorite KRAFT Lite Dressing.